San Diego police are searching for a man wanted for domestic violence charges who escaped police while handcuffed. 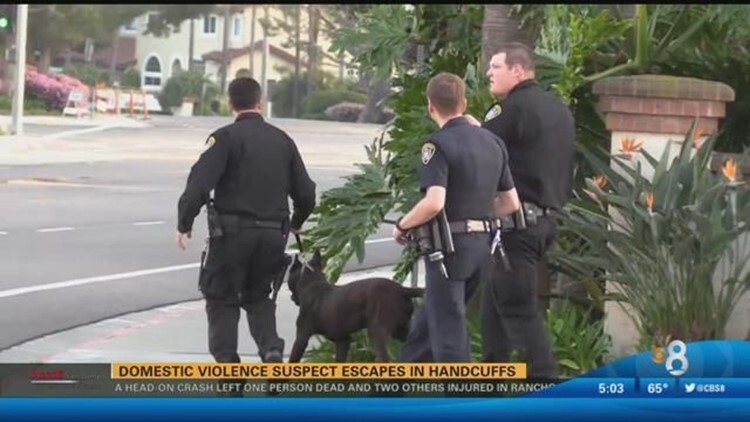 SAN DIEGO (CBS 8) - San Diego police are searching for a man wanted for domestic violence charges who escaped officers while handcuffed. According to police, the suspect followed his ex-girlfriend into a Vons in University City Saturday, violating a restraining order. The ex-girlfriend called her mom when she spotted him and her mom notified police. Officers arrived at the scene and arrested him, however, while handcuffing the suspect, he broke away and took off on foot. An officer fell during the chase and injured his knees. More officers were called in to search for the suspect, but he was not found. He is still on the loose but is not considered armed or dangerous.